Did you know that nearly 40 percent of U.S. homeowners have suffered monetary losses due to water damage? Every year, claims related to mold and water damage cost insurance companies more than $2 billion. The average cost of each water damage insurance claim is about $7,000. Water damage is one of the most common and costly expenses associated with owning a home. 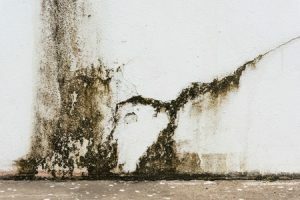 With these troubling statistics in mind, it’s important for homeowners to do whatever they can to prevent moisture intrusions from damaging basements, foundations, drywall and more. This doesn’t necessarily mean you need to completely overhaul your plumbing system, though. 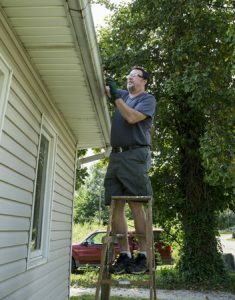 In fact, a little gutter maintenance can go a long way. Your gutter system isn’t just an attractive accessory for your home’s roof. It also serves an important practical purpose, diverting rainwater away from your home so that it can’t stain siding and pool around the foundation. When gutters become clogged with debris, they cease to function effectively. This, in turn, can cause siding and foundations to wear prematurely due to increased moisture exposure. By cleaning out your gutters in the fall and spring, and making sure your downspouts discharge far away from your home’s foundation, you can easily prevent at least one common cause of water damage. This is also a great opportunity to inspect your gutters for signs of damage. 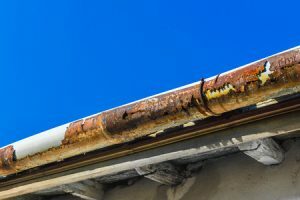 If you spot any sagging or leaky gutter sections, we can repair them quickly to ensure they continue to serve you well. If you have any other lingering questions about your gutter system, feel free to give us a call or contact us online today! Some home improvement projects, like repainting a living room or staining a deck, can typically be done by homeowners with great results. Other projects like gutter installations, however, are best left to the professionals. When homeowners install their own gutters, they usually purchase them in sections from their local hardware store. 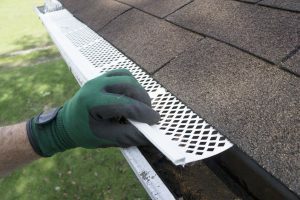 These gutter sections will work in a pinch, but they leave lots of joints where leaks can occur. They’re also not as rigid as seamless gutters, and are therefore more prone to sagging and damage from falling tree branches. 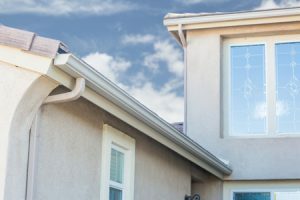 By investing in professionally-installed seamless gutters, you’ll get a drainage system that is not only stronger and more durable, but more attractive as well. Seamless gutters can be custom-fit to your home, eliminating unsightly joints and achieving a clean, finished look. They also tend to have a longer lifespan than sectioned gutters, and are less prone to lakes and environmental damage. This, in turn, protects your home’s siding from the mold and mildew growth that can occur when gutters leak during rainstorms. A professional gutter installation can also ensure your downspouts drain safely away from your home’s foundation. Downspouts that are too short or improperly positioned can cause water to pool around the foundation, ultimately leading to cracks and moisture intrusions. If your gutter system isn’t effectively discharging water away from the foundation of your home, it’s not doing its job. Interested in learning more about the unique benefits of a professionally-installed seamless gutter system? Give us a call today at our toll-free number to speak with a representative!